Gbenga Akinwale, a Nigerian, has joined IITA Lilongwe, Malawi as Program Manager for Soybean. He obtained his PhD and M.Tech degree in Crop Management (Plant Breeding) at the Federal University of Technology, Akure, Nigeria in 2013 and 2007, respectively. He also holds a Higher National Diploma (HND) in Crop Production from Ahmadu Bello University, Kabba, Nigeria. He has a Post Graduate Diploma (PGD) in Crop Management (Plant Breeding) from the Federal University of Technology, Akure, Ondo State, Nigeria. Before this appointment, he was Technical Advisor to The Honorable Minister of Agriculture and Rural Development on Rice Seed Systems at the Federal Ministry of Agriculture and Rural Development in 2013. He was also an Associate Principal Scientist (APS) (Seed System Specialist at Africa Rice (2009-2013). He worked as a Research Associate (Agronomy/Lowland Breeding) at the International Rice Research Institute (IRRI), IITA Ibadan, Nigeria (2008-2009). 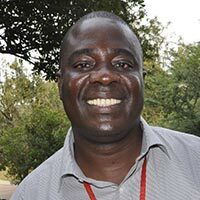 Prior to joining the AfricaRice/IRRI project, he worked at IITA as a Research Supervisor in the Cassava Breeding Unit (1996-2007).